The 78-year-old newsman emerged from retirement to host the event -- a decision many are suggesting was the wrong one. "Vague." "Absent." "Sucked." "Useless." "Roadkill." "The worst moderator in the history of moderation." It's a rough morning to be Jim Lehrer. After Wednesday night's first presidential debate in Denver -- a bout that many say went handily to Mitt Romney, who seemingly located his mojo with a series of spirited attacks on a defensive and stammering President Obama -- no one is feeling the hangover worse than the show's moderator, whose milquetoast performance has been savaged by the press and in social media circles. The former PBS NewsHour anchor's polite attempts at wrangling the political foes were ignored, spoken over, even mocked by the candidates -- with Romney in particular steamrolling Lehrer like a doddering board member harboring the sole dissenting vote. But Obama, perhaps taking his cues from Romney, also dropped his trademark cool to disregard the anchor. "I had five seconds before you interrupted me," the president admonished after Lehrer pointed out that his two minutes were up. He then went on to speak for another 20 seconds, ignoring Lehrer's faint grumbles of disapproval. It was not just Lehrer's lack of authority but also the substance of his questions -- criticized as being both too open-ended and too Washington-insidery -- that many found lacking. Eric Deggans, the TV and media critic for Tampa Bay Times, felt Lehrer's queries offered viewers a lack of context: “Much as I respect Jim Lehrer, also hated stuff like Dodd/Frank and Simpson/Bowles weren't explained to viewers who aren't policy wonks," he wrote on Twitter, referring to the consumer protection act and budget commission mentioned during the debate. "And where were the questions about reproductive rights, gay rights, pay equity, immigration, climate change, poverty or schools?" writes The Nation's Richard Kim. "We didn’t get to them -- because Jim Lehrer got pwned! Or was just plain disinterested." Lehrer almost didn't moderate at all. The 78-year-old newsman moderated 11 presidential debates between 1988 and 2008 and had gone into retirement. But he returned to oversee the biggest night of political theater in four years after being coaxed back with the promise of a new format -- one that allowed for six 15-minute conversations and plenty of time for back-and-forth between the candidates. Whether he now regrets the decision became the lede for the Associated Press' story on Lehrer's performance: "Jim Lehrer may be regretting his decision to come out of semi-retirement and moderate his 12th presidential debate," it begins. "I personally do not know who won this debate," MSNBC host Rachel Maddow told her users. "I do believe that we saw this debate format die a very painful death on camera tonight ... the format and, I think, the moderator, honestly, with all due respect to Jim Lehrer." Her colleague, Chris Matthews, said: "I thought the moderator did not moderate. He didn't follow up. Today, moderators are expected to be aggressive -- they're going to ask a question, they throw it out there, they don't just say a topic. They ask a question." Indeed, only Big Bird -- for whom Mitt Romney professed love even as he threatened to put the Muppet's feathered neck on the chopping block -- trended higher on Twitter after the debate. Pundits barely had begun to file their scathing reviews of the former anchorman before parody accounts like @SilentJimLehrer (sample tweet: "...the...um...") began taking Lehrer to task for his performance. 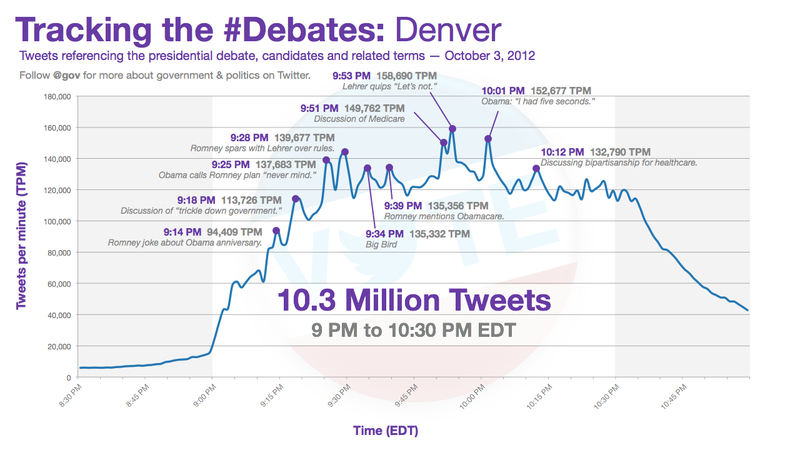 It bears noting, however, that the evening's single most-tweeted moment -- 158,690 tweets -- came during a rare show of mettle from the moderator: when Lehrer interrupted Romney's segue remark, "Let's talk about --" with an intercepting, "Let's not." Elsewhere on Twitter, comedians offered blunt one-liner assessments. "Hey Lehrer, you're the f---ing ref, stop letting the Mittbot bully you -- he can't fire YOU," Bill Maher wrote. He later tweeted that Lehrer "sucked." "Jim Lehrer: 'Miss, I -- I'd like to order...' Waitress: 'SHUT UP NERD I'M NOT FINISHED WITH THE SPECIALS' -- at a diner tomorrow," Patton Oswalt wrote. Lehrer has yet to address his critics: The veteran broadcast journalist is giving no interviews Thursday.